The GE Nautilus dishwasher is an older series of built-in and portable dishwashers. The company no longer offers this model, but you can still obtain replacement parts from authorized GE parts dealers. A common issue with GE Nautilus dishwasher models is that water doesn't drain when the cycle is done. You can often fix this issue without contacting a service technician, saving you money on fees. Your GE Nautilus dishwasher requires automatic dishwasher detergents. If you use the wrong type of detergent, this leads to oversudsing, which prevents the pump from removing water from the tub. The pump instead focuses on trying to remove the suds. Stop the cycle and open up the dishwasher. Let the suds evaporate, and pour 1 gallon of water into the tub. Press the "Start/Reset" button twice to pump out the water. 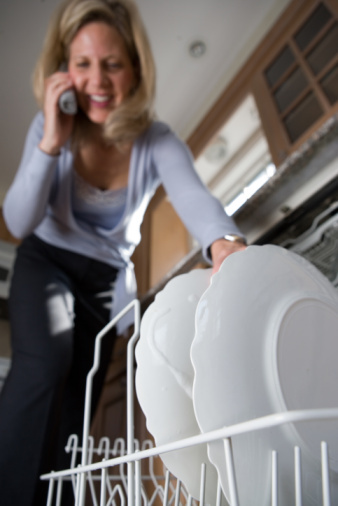 The most common reason why water won't drain from your dishwasher is clogs in the hoses, filters or air gap. The air gap is located near the sink, and the hoses are located on the back of your machine. The filters are located near the pump on the base of the tub. Disconnect the drain hose and look into it with a flashlight. Remove the lower rack and spray arm to access the filters. Clean the components out with a plastic utensil. Examine your household plumbing and see if it's draining correctly. If not, use drainage tools or products to clear the clogs. Contact a plumber if you need additional assistance. Run the food waste disposer if it is connected to your GE Nautilus dishwasher, and remove the knockout plug if you just installed the disposer. The GE Nautilus dishwasher has a drain valve with an internal solenoid. The solenoid controls when the valve opens and closes. Test the solenoid with a multimeter by connecting the red and black probes to the solenoid. If you receive an open reading, replace the solenoid. See if any food particles are stuck in the valve, and remove them. Move any utensils or dishes lying on top of the valve. Lubricate the valve lever if stuck. The dishwasher pump is responsible for directing the water to the drain. Debris can build up inside the pump. Remove the lower rack and spray arm to access the pump. Clean it out with a toothpick or plastic utensil. Examine the pump if it's clean, and see if any component is broken. The impeller has blades that can warp or break off. You must replace the whole pump if any part of it is broken since it's difficult to repair. Misty Faucheux became a freelance writer in 1998 and has been an editor since 2004. She has written for a variety of websites and blogs, specializing in topics ranging from digital photography to computer systems to digital media. Faucheux received a Bachelor of Arts in communications from Loyola University New Orleans.